Meredith brought a cucumber home yesterday and requested the cucumber salad that’s included in my new book–Healthy Eating for Life due out next January. I’m thinking to save it ’til tomorrow to go with some sardines from Realmont market. We’ll have her cucumber for lunch though in this simple, quick-to-do tuna salad below from Delicious Dishes for Diabetics. Adapted from an early Nigel Slater recipe, this is very handy as a quick standby when you feel at a loss for something to serve as a light lunch. 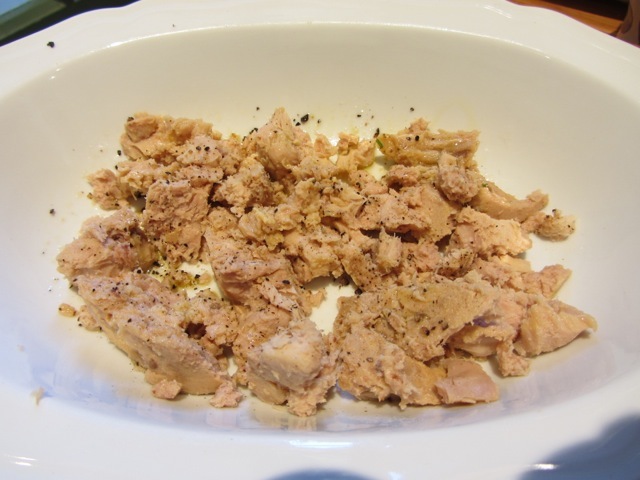 Put the tuna into a favourite serving bowl and add a couple of twists of the pepper mill. add the parsley, chives, salt and pepper together into a thick sauce. 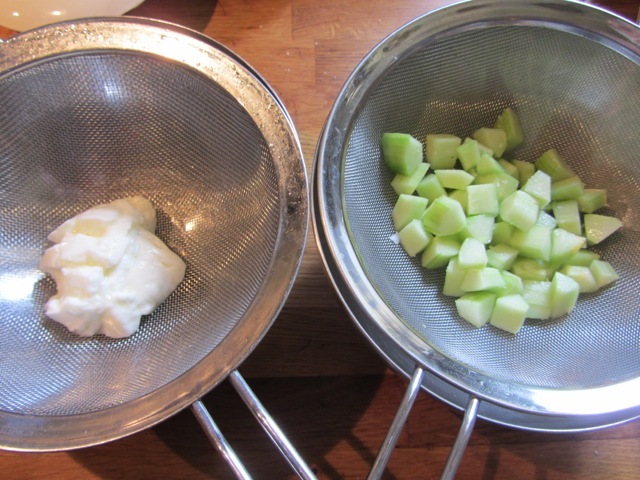 Add the cucumber, onions and seeds. Pour the sauce over the tuna and turn over all the ingredients carefully. Sprinkle over the remaining parsley and serve with a crisp green lettuce. Will have this for lunch today. How about some recipes for tinned sardines? (we don’t get them fresh in Vermont) I love them and they are good for health but my husband isn’t fond of them, so perhaps a tempting recipe would change his mind. As a kid/youngster I loved tinned sardines, mashed up, with a twist or two of the pepper mill and spread on lightly toasted bread and grilled briefly. Should be sizzling when it emerges from the grill. I sometimes added a thin slice of tomato. I might even try it tomorrow again! My mother used to put our home-grown cucumbers into tuna and potato salads. They were delicious–a taste of summer that I’ve never forgotten. Cukes don’t agree with my husband, so I’ve been bereft of them for 50 years. 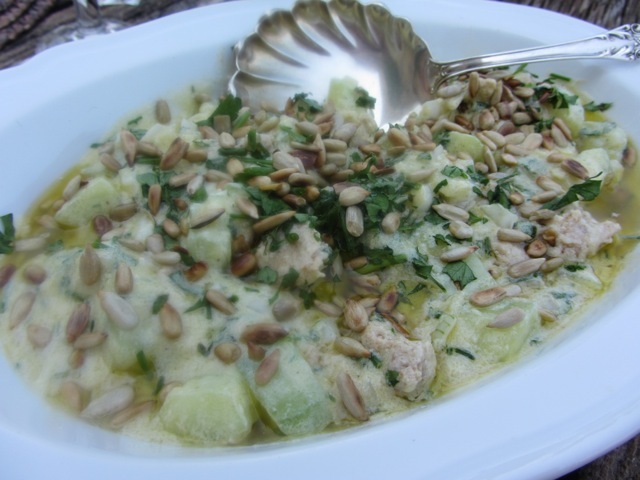 However, I am going to make up a batch of this tuna salad, halve it, and put all of the cucumber into my half! It’s raining cats and dogs here in New Hampshire, and has been doing so for several days. Gardens are waterlogged. This weather pattern may cross the Atlantic and head in your direction, I’m afraid. Recipe sounds great and will give it a try. Any chance of more of your fab recipes being downsized for 2 people. Will look forward to trying the tuna salad recipe. Re sardines, recently I read about incorporating them in tuna salad: 2 cans of light tuna, one can of sardines, celery, pickles, carrot, onion, spices, and mayonnaise. I made that and it was good. I like your sardine recipe too, Robin. on July 4, 2013 at 1:09 am | Reply Dianne P.
PS: Happy 4th to Meredith!! So glad, Dianne. My grill pan goes over two burners too. It does take a little time but I’m happy you both felt it was worth it! Somebody gave me a bottle of mustard oil, Mr. Ellis. I’m not exactly sure how to use it in cooking. 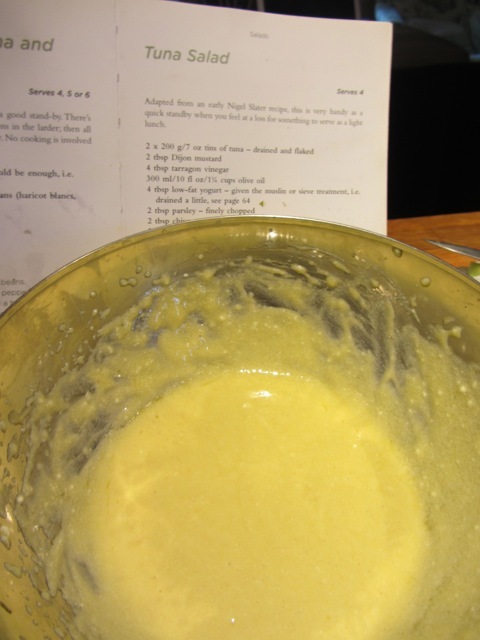 Have you got a simple recipe for it?